If you are trying to join Shining Needle Society and you don't hear back from us within 48 hours, please email me and I will be happy to help you with your membership. Please put "Shining Needle Society" in the subject line of your email. To provide nurturing and inspiring opportunities for growth in the study of needlework, with the hope of continuing the legacy of embroidery art for future generations. 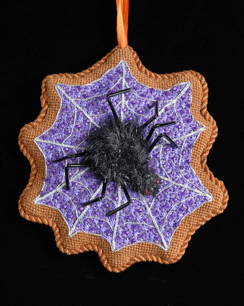 The picture above shows one of our current classes, "Along Came a Spider," the first in a series of Halloween ornaments from Janet Zickler Casey. Class is currently in session at Shining Needle Society. Shining Needle Society is a friendly, supportive group that seeks to provide connections for enthusiastic stitchers and the teachers who inspire them. We sponsor online support groups for needlework classes.There are no dues for SNS and membership is open to interested stitchers. SNS Home Room is our main communication vehicle for all SNS activities. New online support groups for needlework projects will be announced on this list. So how can you participate in Shining Needle Society? We're set up like a school, so Home Room is for announcements of future activities and it doesn't generate many emails. SNS Home Room: everyone in SNS should be on this list. It's for announcements ONLY. click here. SNS GAR Classroom: an open classroom for those who love Gay Ann Rogers' projects click here. SNS Student Lounge: sharing and conversation related to stitching and needlework click here. Neatly lightly swiftly sew, Clicking softly as you go, Shining Needle, none shall be ever better friends than we.